Let’s talk: it’s a small offer that can make a big impact on someone who is struggling with their mental health. It’s also the theme of the winter-term Thrive Week, a series of events organized by Wilfrid Laurier University’s wellness education coordinators to build and encourage positive mental health on campus. Thrive Week starts on Sunday, Jan. 28 and runs through Feb. 2 on Laurier’s Waterloo campus. A new friendship bench will be unveiled Jan. 31 in Waterloo. Laurier’s Brantford campus will hold Thrive Week March 12-16. “Winter can be a really difficult time for a lot of students. We want to help them build resiliency and create a coping toolkit that they can use anywhere,” says Jodie Lockey-Duesling, the wellness education coordinator recently hired at Laurier’s Brantford campus. Thrive is an initiative developed at the University of British Columbia to inspire campuses across Canada to focus on mental health during a week each October. Laurier’s first-ever Thrive Week, held in October 2017, was so well received that the Mental Health Advisory Committee decided to bring it back for the winter term. Winter Thrive Week features several activities designed to get students talking about and taking care of their mental health and overall wellness. The Athletic Centre, Student Success Office and the Delton Glebe Counselling Centre also contributed to Thrive Week’s schedule of events. Students can learn about nature therapy, get creative with chocolate art therapy or do yoga. The full schedule of events is available online. 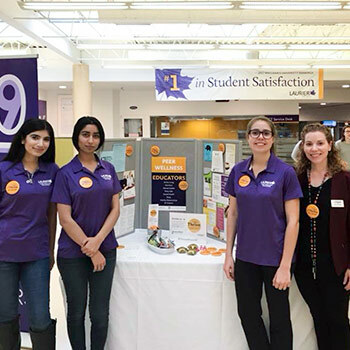 Laurier’s campus wellness centres offer numerous professional services for students, from one-on-one counselling to educational workshops, and student-led initiatives such as the Peer Wellness Educator Program. The schedule of events for Thrive Week at Laurier’s Brantford campus will be posted online in early March. Thrive Week events are open to all Laurier students and are free to attend. A Laurier Friendship Bench will be unveiled Jan. 31 at noon during Winter Thrive Week. The bench, located in the foyer connecting the Paul Martin Centre and the Wellness Centre on Laurier’s Waterloo campus, aims to encourage student-to-student conversations about mental health while promoting campus support resources. It is part of the mental health initiative created by the family of Lucas Fiorella, a 19-year-old student at Carleton University who died by suicide in 2014. Fiorella, remembered for his “selfless acts to support others suffering from depression,” was also suffering from depression – something unknown to his family and friends. The bright yellow bench features a plaque that promotes the hashtag #yellowisforhello, a social media campaign designed to reduce the stigma around mental health among Canadian youth. The campaign website, yellowisforhello.org, features video tips and tutorials that address topics such as depression, anxiety, stress and emotions. Students from the Waterloo campus club Bridging the Gap initiated the bench project by applying for funding from the Student Life Levy. More than 30 Lucas Fiorella Memorial Friendship Benches exist on high school and post-secondary campuses across Canada. The Laurier community is invited to attend the unveiling event of Laurier’s friendship bench. Light refreshments will be served.